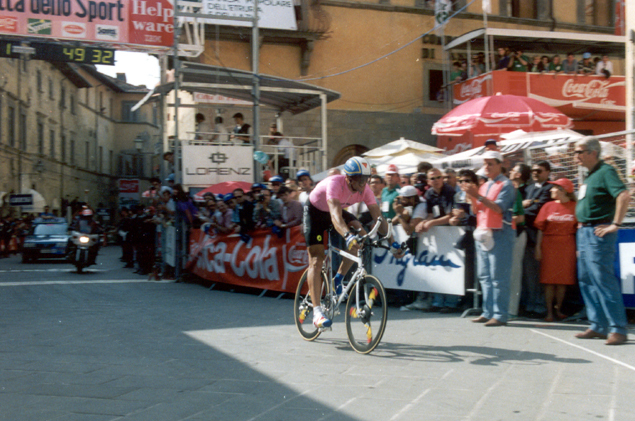 Miguel Indurain's (winner of the 1991 Tour de France) announced intention was to ride the Giro conservatively, as training for the Tour. 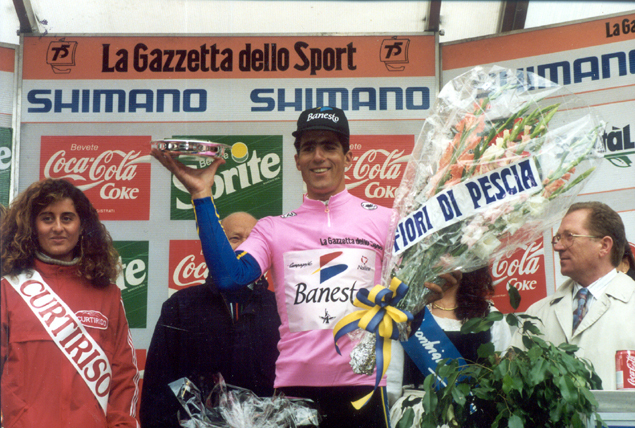 But in the third stage, Indurain and Claudio Chiappucci raced hard, making Indurain's intentions clear. Indurain took the lead in the third stage and never gave it up. He used his normal strategy of containing his adversaries in the mountains and smashing them in the time trials. Some sites call the opening Genova time trial a prologue. 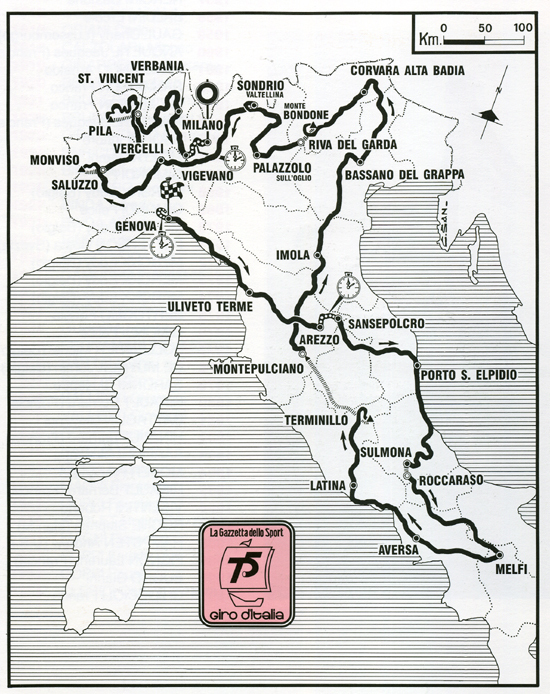 The official Giro d'Italia guide book calls it stage 1, which we do here as well. Something strange was afoot. Some riders from a few teams, specifically Spanish and Italian squads, seemed to display an inexplicable superiority over other riders and teams that should have been on the same level. Greg LeMond said that in 1990 his “Z” team was among the most powerful in the world. Yet, in a remarkable turnabout, the same “Z” riders could not keep up with the best teams in 1991 Tour. A new drug had entered the pharmacopoeia of the competitive cyclist, EPO. Without EPO, it was nearly impossible for a racing cyclist of the 1990s to compete effectively, so great was EPO’s performance improvement. Hematocrit is the measure of the percentage of blood volume occupied by red blood cells, which the body uses to feed oxygen to the muscles. Normal men of European descent have a hematocrit in the low- to mid-40s. It declines slightly as a response to the effects of training. It does not increase during a stage race, as many racers accused of its use would assert over the next decade—it goes down. Exceptional people exceed these hematocrit values by a significant amount. Damiano Cunego, winner of the 2004 Giro, through a twist of genetic fate, is said to have a natural hematocrit of about 53. To improve their performances, endurance athletes took to using synthetic EPO (erythopoietin), a drug mimicking the natural EPO the body makes to signal the body to produce red blood cells, thus raising their hematocrits. This is not without danger, because as the hematocrit rises, so does the blood’s viscosity. By the early- to mid-1990s endurance athletes were dying in their sleep because their lower resting heart rates couldn’t shove the red sludge through their blood vessels. In the early 1990s at least a dozen bicycle racers died in their sleep. Writer Jean-François Quinet put the number of dead athletes much higher, estimating that 80 riders (both amateurs and pros used the drug) perished as a consequence of EPO abuse. I spoke to a mechanic who traveled with a top-flight Spanish pro team in the mid-1990s. What he saw frightened him. The racers slept with heart-rate monitors hooked up to alarms. If a sleeping rider’s pulse fell below a certain rate, the alarm went off, the rider was awakened, given aspirin and a saline injection to thin the blood and put on a trainer to get his heart rate up and blood flowing. This was clearly dangerous stuff at the doses racers were using and everyone knew it, but it had a gigantic payoff to the talented and lucky user. As La Gazzetta put it, there was a change in the hierarchy of some teams: the doctor was now more important than the director. Nearly all of the top riders of the 1990s had accusations of EPO use leveled at them. Some have confessed and more than a few have had health problems ever since. Miguel Induráin entered the Giro with the clear plan of riding conservatively, using it as training for the Tour. Fignon resigned himself to racing in the lesser capacity of road captain and advisor to Bugno’s Gatorade squad. Fignon was entered with teammates Giovannetti, Alberto Volpi and rising hope Ivan Gotti. Bugno took a pass on the May race to concentrate on preparing for the Tour. Chioccioli hoped to repeat his dominating 1991 performance and Chiappucci, nicknamed “The Devil”, had followed up his second place in the Giro with third in the Tour, winning the climbers’ prize along the way. Prologue specialist Thierry Marie was first in the 8-kilometer opening individual time trial in Genoa, beating Induráin by 3 seconds. The Spaniard’s supposed low-key ambitions were betrayed when he voiced disappointment at not having taken the maglia rosa at the gun. That must have frightened the other competitors who were hoping the ’91 Tour winner was just in Italy for a training ride and espresso. Two stages later, the pretense was over as Chiappucci and Induráin, fighting for supremacy in the Giro’s first stages, blasted over the Scopetone, a climb just outside Arezzo where the stage finished. Maximilian Sciandri won the stage, but in the havoc of the climb, Marie was dropped, making Induráin the Pink Jersey. Professional racers ride close together, much closer than amateur racing cyclists or enthusiasts on club rides. Because of this, they are constantly on the alert for trouble. Fignon explained that crashes in the pro peloton can involve a large portion of the pack if they can’t hear brakes being applied up ahead, and that is a common occurrence because the television helicopters like to fly low to get good pictures. The din of the rotors makes it impossible to hear what is going on and if a crash has occurred up ahead, the riders in the back can’t hear the brakes and the sound of the crashing bikes, and keep pedaling at race speed right into the catastrophe. During this third stage Induráin was so bothered by the television helicopter that he rode over to the race director’s car to complain about the danger. The next day’s 38-kilometer time trial was Induráin’s. Of the competitors, the closest was Chiappucci, more than a minute slower. 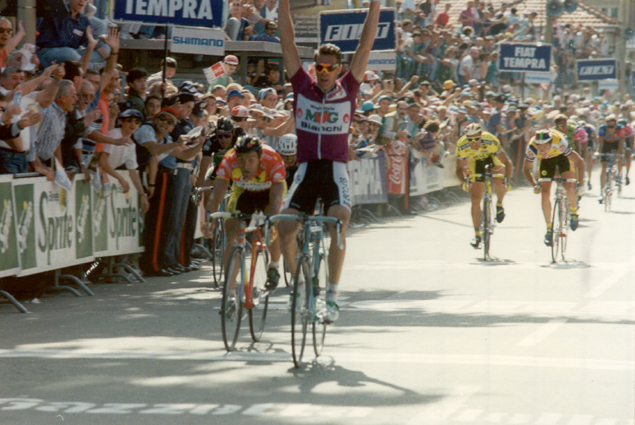 The form that had won the Tour the year before was present at the 1992 Giro. Heading south, the race went through the Apennines over roads that weren’t challenging enough for anyone to mount an assault on the Pink Jersey, that opportunity presenting itself in stage nine, with a finish at the top of the Terminillo. The first serious attack came from the Latvian rider Piotr Ugrumov. Then Roberto Conti shot up the road and got a good gap, which he managed to keep for a while. Meanwhile Induráin, a bigger rider (6'2", 176 pounds or 1.88 meters, 79.8 kilograms) who didn’t change speed quickly on climbs, was getting his engine going. Finally, he came roaring up to Conti with Chiappucci, Hampsten, Giovannetti and Herrera hanging on to his wheel for dear life. Fignon couldn’t stay with him, neither could Chioccioli, whose short time in the sun as the master rider was over. With a kilometer to go, the Spaniard was still pulling his train up the mountain. Herrera, no danger in the General Classification, took off for the finish, but Chiappucci had to let the Induráin group go and gave up 30 seconds. After a transfer back to Tuscany, it took two stages to bring the Giro to Bassano del Grappa and the Dolomites. Stage twelve went over the Staulanza, Giau and Falzarego passes, and at this point Induráin saw no point in wasting energy in offensive climbing. When an attack went off, he would slowly climb up to the attacker’s wheel. Chioccioli and Chiappucci (who seemed to have formed an alliance in an effort to destabilize the Spaniard) knew they had to gain time in the mountains because they were completely helpless in time trials against their powerful opponent. But with each acceleration, Induráin would calmly and easily close the gap with a pedaling cadence that was high for such a big man. Franco Vona won the stage with Induráin and Chiappucci together just three seconds behind. The next day, with the Campolongo, Pordoi and Bondone ascents, it was more of the same. Induráin had things under control as few racers in cycling history ever have. The third to last stage, with its four major rated climbs, was the last chance for Chiappucci and Chioccioli to take the Giro. Chiappucci was the first over almost all of the climbs and Chioccioli, displaying terrific form, hammered away. But Induráin was not to be dropped. Content to ride defensively, he continually marked his attackers. Chioccioli at least got a stage victory to show for his trouble while Induráin, Chiappucci and Lelli finished right with him in Verbania. The three days in the Alps changed nothing. It was almost as if Induráin were deciding who would be allowed to win a stage: Giovannetti got the seventeenth, Udo Bölts won the next one and the unrelenting Chioccioli was victor in the nineteenth stage. Always, the maglia rosa was right next to any challengers to his supremacy. The final stage was a 66-kilometer time trial into Milan. Of course Induráin won it, catching Chiappucci just meters before the finish. Induráin biographer Javier Gárcia Sánchez said that the gratuitous catch was intended to give Chiappucci a psychological blow for the upcoming Tour de France. If that had been his intention, it was a waste of energy; in the Tour Chiappucci was undaunted. His unsuccessful attempt to unseat Induráin with a brave and brilliant ride in the Tour’s Sestriere stage has become the stuff of legends. This was Laurent Fignon’s final Giro ride. He finished 37th and went on to earn 23rd in the Tour, winning a single stage. He retired from racing the following year and in 2010 died after a brave fight against cancer.